It is 7:30 am and I am lying in bed with a cup of tea, thinking about how best to bring my artwork to some sort of resolution. Today is the last day of Art Town's two live art weekends. I will be back in Maddock Street, near Windsor station. After mucking around with my painting yesterday for the first hour or so, I finally gained some traction when I went back into the portrait. It takes a little time to settle into a working 'zone'. My goal with this painting was to capture the spirit of Chapel Street life within the public space of the no. 78 tram. The painting subject and composition is set to reflect an image on a digital device. Hence, yesterday morning I had set out to place icons within the white space below the cropped painting in the middle. After laying out or blocking in shapes and colours to represent social media icons, I decided the piece had become unnecessarily detailed, busy and somewhat too "lollly" in its look. I rubbed out theses icons (the beauty of oils) and left three simpler icons instead. Happier, I then decided to work up the central image and portrait itself. I had been procrastinating and obfuscating my way around the canvas. 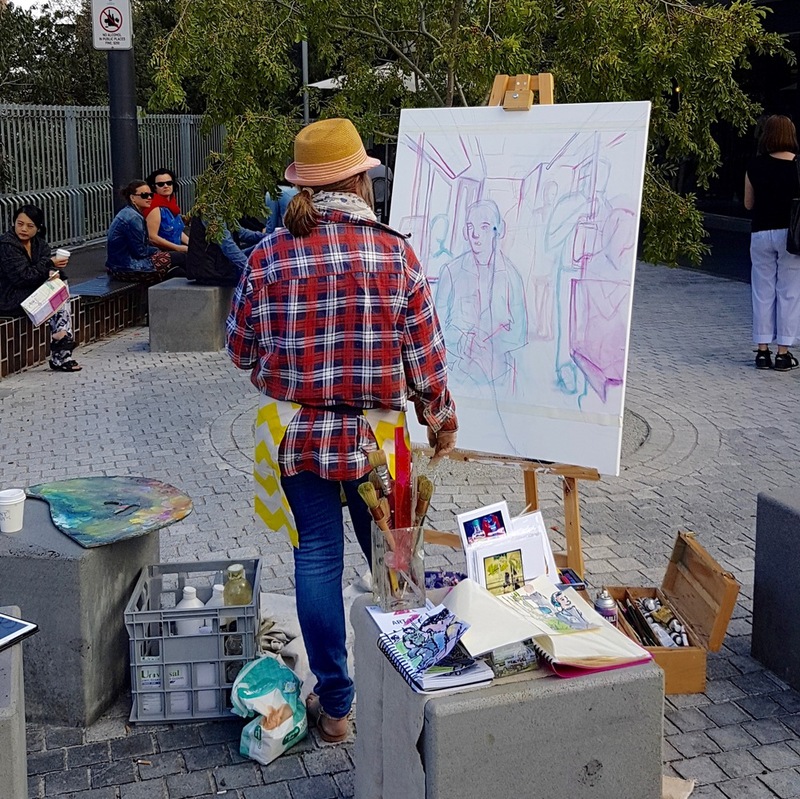 It can be awkward enough when you are noticed drawing in the public sphere, more so on a tram as people are so close and watch your progress. When I work in a small sketchbook, it much easier to be discreet, in fact, people are generally so engrossed on their phones, iPods, iPads and laptops, that most often the public are oblivious.... So taking photos of people on trams was not something I could do. (There is quite possibly a law against it too, but I'm not sure). I am much happier painting this way as it forces me to be more creative and imaginative. Using memory and feeling helps me to condense and simplify forms and focus on expression. Yesterdays weather was perfect. Hopefully today, Sunday, will be similar. Before heading out though, I need to attack the kitchen. I have been neglectful of some housekeeping in the last few days. The dishwasher smells, as no one, myself included, thought to turn it on....and so the benches are littered with dirty dishes. The small saucepan has the remnants of last nights SPC alphaghetti, the larger saucepan, pumpkin soup. Both have dried crusts around the edges and the insides, so they badly need scraping. Toast crumbs dot the timber bench surface. Being busy with Art Town yesterday, Saturday 9/4/2016, meant that I could not watch or listen to the footy. I missed the Coodabeens, my favourite radio show and wasn't really in a position to don my headphones whilst painting in public. People come up and like to chat, which I love. Richmond's game against the Adelaide Crows seems to have been a good game to have missed. I will do catch up footy with Gerard (Whately) on 774 on Monday. P.S. Thinking later about the tin of alphaghetti ..... unless I bought it accidentally, it could well have been quite a few years old, the youngest is 10....anyway, bottulism doesn't seem to have taken hold in the days since. All is good. Yesterday was fairly productive. Finished off the portrait, worked a little bit on the hands... they still need a little bit of tidying up and definition. There are probably figurative anomalies. I will consider which to fix and which to leave alone. I'm not keen to lose imperfections at a cost to overall expressionistic feeling. As a whole I am reasonably satisfied that the work is coming to a conclusion... for now. This painting will be the first in which I have painted a portrait in public. Usually, I prefer to focus on portraits without any distraction in the safety of the studio. Anyway, good, bad or otherwise, it captures the mood that I wished to create. From a painting point of view, it was interesting to consider the effect that the outdoor light may have had. When I got the painting back into my studio on Saturday, I had planned to finish off the face there. However, the indoor lighting was too difficult to work with...I couldn't see the face the way I could see it outside. I'm wondering if the outdoor light creates a softer image?...or is my eyesight failing me?@? I finished the day off with GB, a beer and a burrito at Fonda in Chapel Street. I will post the finished image after the exhibition. And, many thanks to all the people who stopped by to talk, compliment, critique, discuss, photograph and to just give their two bobs worth; to the yr 7 boy curious about my use of one point perspective, the lady with red lipstick and chihuahua who said she 'can't even draw a stick figure" and the islander man with the bomber scarf who barracks for Essendon because he likes their colours and knows '"nothing about football"! @ it was great to meet and talk with you all. Without you, there would be no inspiration to create. Thanks.